Wurthymp Wood is a 17 acre / 6.9 hectare plot, forming part of a mixed woodland 30 acre farmland project planted by others in 2006. From 2014 it has stood as a stand-alone woodland conservation project in a wider landscape mosaic. 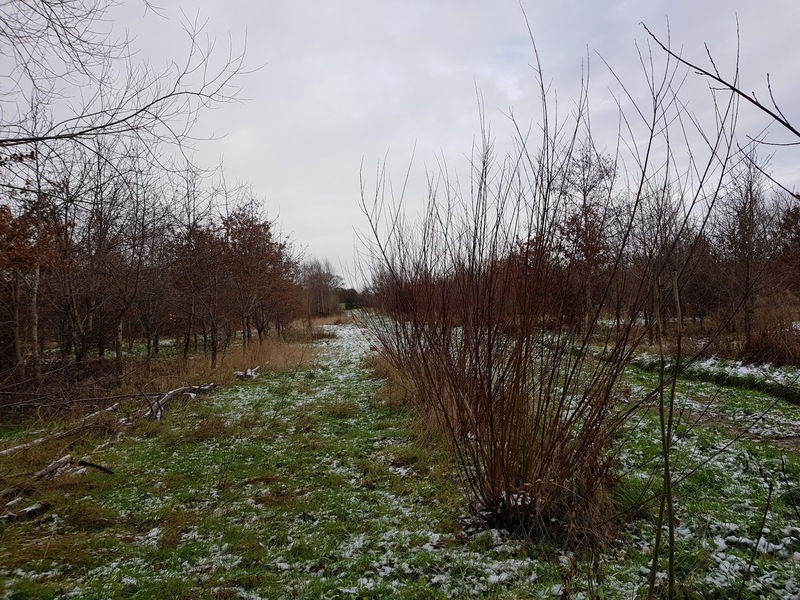 The woodland is privately owned and funded and is run on a break-even sustainable basis, resources are shared with the Meadowcopse Orchard Project a few miles to the north. a, Wildlife habitat conservation (trees, grassland and ponds). b, Rotational coppice woodland management (thinning, regeneration, rural craft materials and firewood). c, Selective long-term forestry tree management (coppice with selected standard trees left long-term). d, Community, educational and research engagement, for the promotion and understanding of wildlife and sustainable conservation in a wider landscape context. 2018 came to an end quite positively. Major success was the charcoal manufacture in a ring kiln. This is a sustainable high value product from coppice and thinning operations within the woods. Some landscaping and levelling within the site between the footpath and private trackways should mske access with the woods easier. With best intentions, the previous owner set out inner and outer oval access tracks within the tree planting scheme around 2006 / 2007. 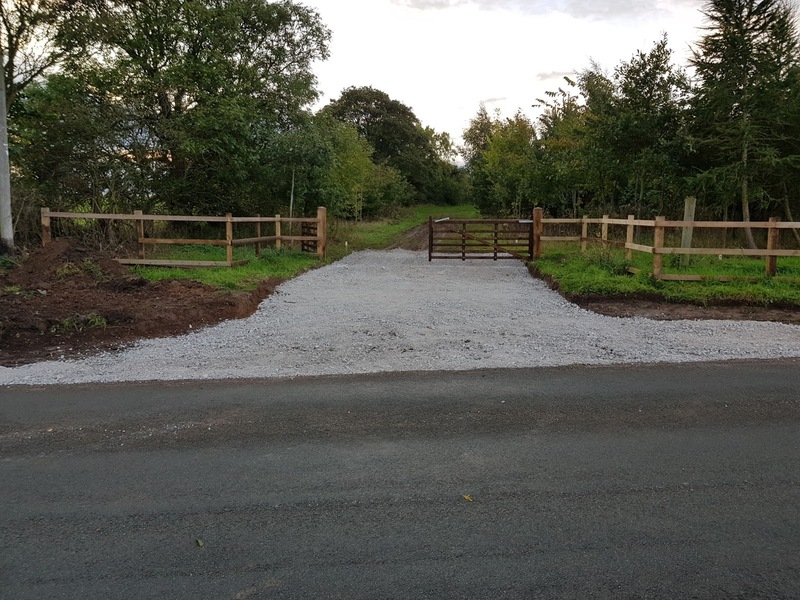 This is relatively universally accepted good practice, as it allows access for thinning and future harvest, as well as considerable 'edge habitat' for wildlife diversity. Unfortunately (or fortunately) for me, compared to the neighbouring site, there was no innert infill. This means the track base (below normal ground level) is not really useable in winter due to mud and leaves a low spot where it crosses the footpath. 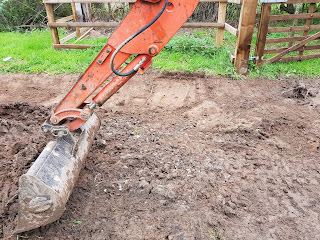 Rather than import innert rubble filling, I have begun to work the levels back up to finished ground level with clay (which is adequate for my levdl of access at present operational levels). The first thorough coppice compartment had some trial cutting in 2016, with great success. This is now part way being worked where 20 to 30% of trees will be left to grow on for another 80 to 120 years and the regrowth from cut stems reworked in about 8 years time. (The site being divided into sevenths of the total area, the cutting cycle being repeated on an 8 year cycle). Coppicing initially looks brutal, but prior to 2006 the land was open fields with reasonable grassland plant diversity. These species and other wildlife would eventually be compromised as the trees block the light hitting the ground. 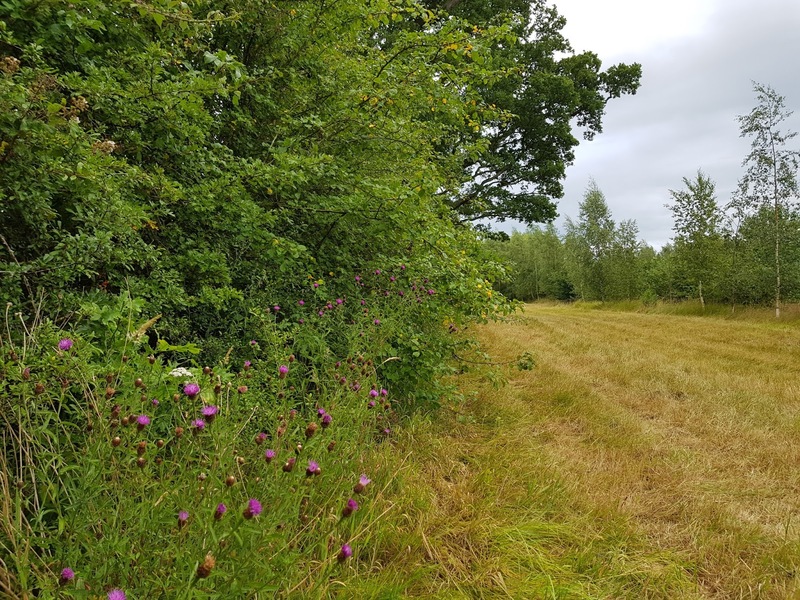 Working areas of the site as a coppice woodland gives a fantastic opportunity to maintain wildife species diversity, without disrupting much of the site per year. Negative aspects have been a worryingly dry prolonged summer (will be interesting to look at tree growth rings if narrow, as well as longer term potentisl climate change). Another concern is Ash Die Back disease - now endrmic in the area and about 25% of the site trees (2000+) potentially affected. Some overlap work with the neighbour has been my south hedgerow. For various reasons, this has been a bit neglected for the last 20 years by previous owners. Initially goid for wildlife, tge benefits fall away once blackthorn has become dominant and spread outwards, with the original hedge line declining. Radical intervention and gap replanting is ongoing into spring 2019. From about 2 years since I acquired the site, some ungounded rumours started regarding development. This seems to have been a projection regarding a previous neighbour and village attitudes. Such things can become quite toxic, as well as being a distraction. I have no desire to develop the site. I have however secured permission via the local planning department to put up a barn / wood seasoning shed. People get emotive about planning, particularly on village fringes. Emotion counts for little in planning legislation, both an application, or any objection has to be technically competent in planning determination. 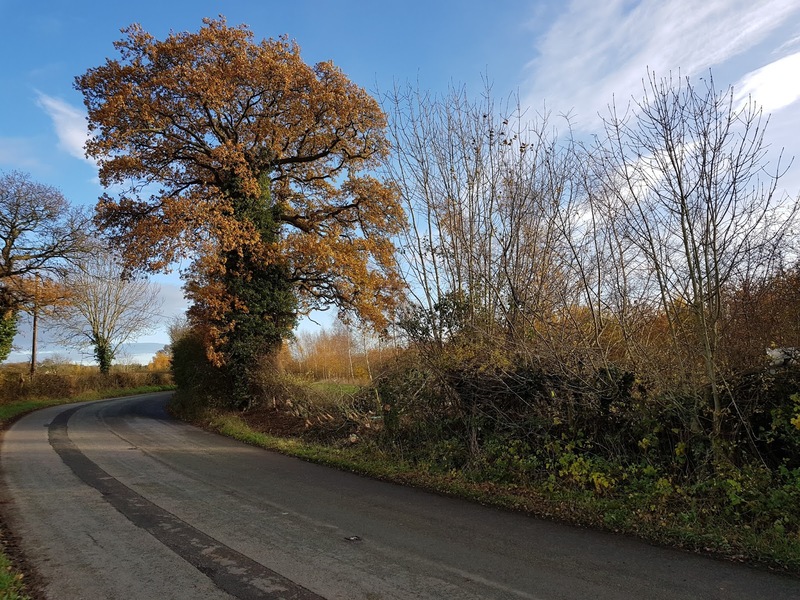 A lot of people are 'surprised' that there is a presumption for approval for agriculture / forestry planning matters (subject to appropriate support / mitigation documents). Wildlife remains enchanting, with hares, foxes and badgers often sighted. Quite a bit of bird diversity, owls in good numbers too. Hopefully leaving the tree side-pruning brash in heaps at the trackway sides gives a good food source of small mammals for the owls. A downside has been grey squirrel dsmage to the taller trees. A few visitors throughout the year, both random and organised. A pleasure to host a camping weekend to a few wildlife and bushcraft friendly friends. Permitted development rights allow 28 days a year of leisure use, so a relaxed sharing and educational capacity and a stunning summer for camping made this a pleasure. Another high spot was a visit from my Uncle and his Wife on a journey south from Scotland. A professional forester with the Forestry Commission for several decades, it was a relief to have no adverse observations, as well as an extra pair of eyes looking ahead at things. Paperwork seldom sounds exciting, but some tweaks to the longer term management plan for the woods and a move towards the 'Grown in Britain' woodland accreditation scheme adds value. Secondary aspects are a local landscape history document (Wales has put local tithe map info online). A priority for me has been to keep an overview folder up to date. This is helpful to explain what the woodland is about snd how it moves forward over time. I hate putting signs up, but a few basic ones regarding dogs, access etc. and some operational overview ones are arguably helpful. I hope to put a proper 'information' board up that isn't too obtrusive. Rather pleased with the printed bags for the charcoal made in the woods. £5 for a 2.5kg lumpwood bag (or £20 for 5 bags). Should light from a single match, without having to use any lighting fluids that can taint the food on a barbeque. From a rather wet winter to a rather dry summer. A small amount of conservation related groundwork and minor tree management in the woods. A big distraction due to some personal health issues slowing me down and some home life projects to get on top of back home in Chester. Quite pleased with some late spring and early summer wild flower proliferation at the woods, particularly where I had transplanted and seeded local varieties. The open grass is being left as late as possible as a hay crop (again helps wild flower diversity). This year the footpath is doing particularly well with the extra width allowing extra light after previous years tree trimming. Some ground work near the boundary by the neighbour has seen an extra pond creation. (For clarity, whatever rumours circulate about work on the edge of the village, I'm not involved in other folks projects, but maintain a healthy 'arms length' conversational approach where nature friendly landscape aspects overlap. Disappointingly, some shady characters have been witnessed about the village late at night. Report anything suspicious on the police non-emergency number, so that rural crime gets attended to and minimised. Next project is a series of charcoal kiln burns from wood cut on site that is either from managed coppice creation or thinnings as the future profile of the woodland is managed. I would be grateful, if the person in the village making unfounded gossip about myself, my property, its boundaries and neighbours would kindly stop. For the avoidance of doubt, I have no business connections to anybody else. (Such issues have been raised before and cordially addressed with a hosted visit by a small number of local residents). I'm not sure of the motives of someone to make things up and present such things as fact to others, other than being misguided as well as somewhat discourteous. At this stage I don't consider it malicious. I will however politely address any issues that have spread and arisen from conversations that have taken place, so that recipients have the chance of a balanced and truthful view. Winter suddenly appeared after a 'damp' mild couple of months (Two years ago, winter was almost unworkable due to saturated ground from November to February and having to leave vehicles at the gateway. The mild damp isn't great for plant and tree health with risks from pathogens). Other weather challenges have been a couple of storms - high winds helping the autumn leaves depart the trees (although this is mainly a biological process by the tree...) - the extra vision through the denuded trees helps spot hazardous 'hung' lengths of branches from grey squirrel damage (they particularly strip bark about 2 to 3 metres down from the tops of the high willow trees). This poses the risk of sizeable falling branches at some point, as well as compromising tree viability. The worry is that they will move to the slower growing oak and ash in the woodland. Grey squirrel damage has noticeably increased in the taller trees over the last year. It was a great opportunity to have talented Cheshire ecological botanist Joshua Styles visiting the woodland plot late summer. Although a bit tight for time, an incredibly detailed range of vegetation species recorded and a great help towards steering a relatively young woodland with open grassland, into a suitable direction for long term sustainable habitat management. One waits for an ecologist, then another comes along - in a wider joined up habitat context, Dr. Martin Page from Cheshire Ecology paid a visit whilst working near by. Underpinning the importance of working in a wider overall landscape habitat context with others. Although this year has mainly been tree and plant focused on site, quite a bit of effort observing and monitoring wildlife species and populations. 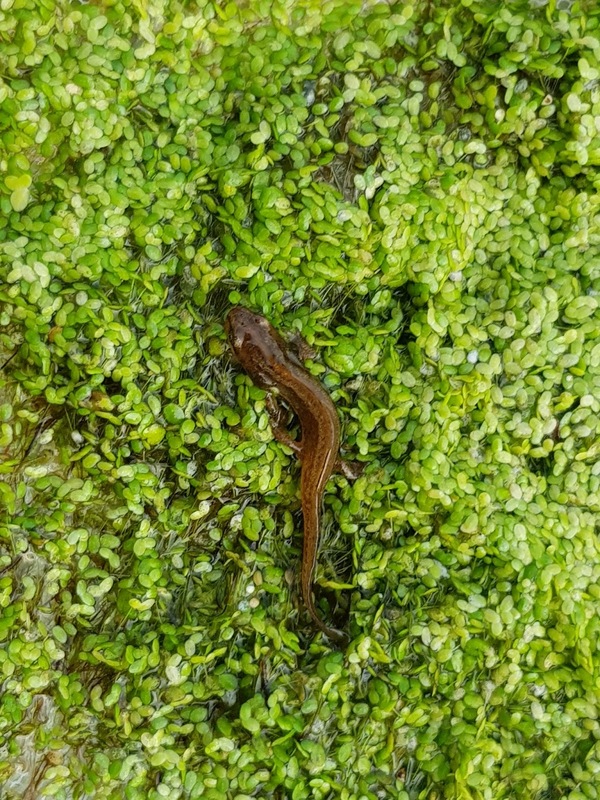 Another area of work, or rather a battle, has been invasive duckweed in the central pond in the woods. 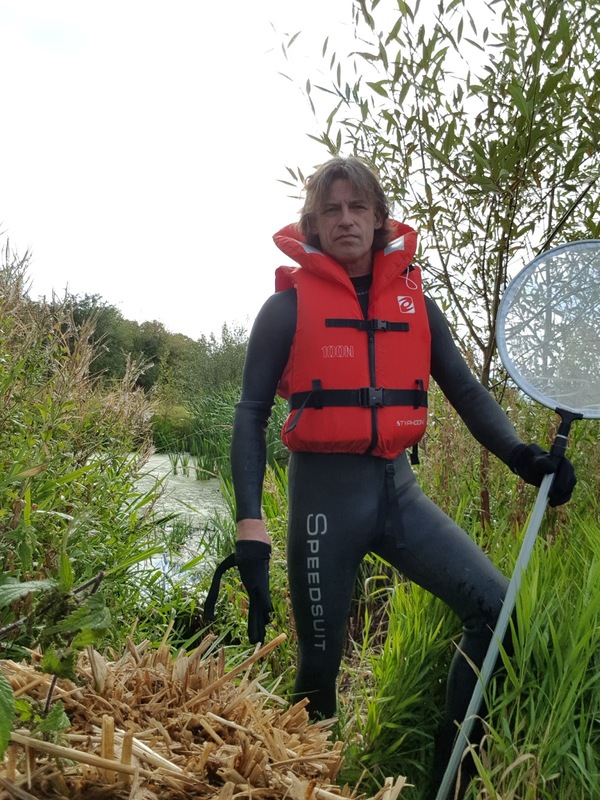 Quite a bit of work both in a wet-suit netting and removing, pumping out and a small rowing boat has made some small headway. Chatting to more experienced folk, it would seem the location and hedges shelter the pond from wind and allow the duckweed to proliferate (compared to more exposed ponds in the locality, where a prevailing breeze pushes clumps of the weed to pond margins). It's an ongoing battle - particularly as the cover leads to further Eutrophication and compromising the water quality and potential for wildlife in the pond. 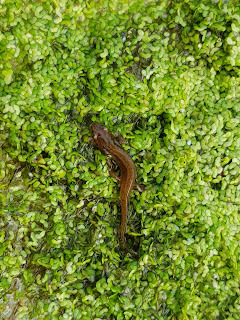 I did happen to spot a juvenile Palmate Newt overwintering (ironic, considering I've started to make a bankside 'hibernaculum' for reptiles), no great crested newts spotted yet. Various frogs and toads in the open grassland vegetation throughout the site too. I've had numerous off-site visits elsewhere over the last few months - site visits, courses, conferences, trade fairs etc. The fantastic Smallwoods at Ironbridge / Coalbrookdale, Shropshire host both practical courses and meetings for interested parties (with a great cafe on site too). Mindful of my 'carbon footprint, whilst travelling down south - a visit to Mole Valley Farmers for some tools and equipment (They have just taken over the troubled 'Countrywide' stores further north), together with a visit to specialist tree nurseries for my orchard project and then a look through Somerset and Wiltshire landscapes at a leisurely pace for a day or so before heading home. 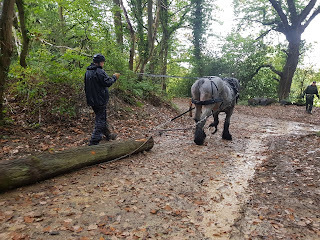 Shropshire being on the doorstep, I had a wet but informative day horse-logging south of Shrewsbury. (I've worked heavy horses before with old agricultural implements, as well as riding, driving and a brief attempt at jousting)! I'm seriously considering the utility and low impact of a horse working tree extraction whilst coppicing in the woods (compared to a tractor or dumper). On the subject of coppicing - how does one convince folk that selective of chopping down trees can be good? (in the appropriate circumstances). Coppicing is arguably the most sustainable and traditional method of woodland management in the U.K. - the periodic cropping of trees, the light coming in until multiple stems regrow, gives a long sustainable cycle to woodland custodianship. It is the main aspect behind the Wurthymp Wood long-term management plan - yes a significant number of quality trees will be left to grow on as forest trees beyond my lifetime, but meanwhile a variable under-story over a cycle of time, will let light in, the vestiges of grassland flower seeds allowed to flourish until the light is shrouded by tree canopy, then opened up again on a long repeating cycle. Because I'm also slowly working my way through traditionally laying the roadside hedge, I might have to use a tractor and flail with regards to impingement road traffic safety. There will come a time when an area of coppice is adjacent to layed hedge. This has implications for the several barn and tawny owls on site and possible flight collision with traffic. Some of the coppice edge trees near the roadside hedge are being pollarded - that is cut traditionally above animal browsing (head) height. It means any owls foraging across the woods when passing over the pollard regrowth, are above any (particularly HGV) traffic along the road boundary regarding impact. A bit late in the year, a visit to the talented folk at Alvecote Wood near Tamworth on one of their informative open days. Always a pleasure to visit and learn what what have been up to. Apart from having an established historic woodland, they are about 6 or 7 years ahead of me on organisation and management. Together with a young woodland alongside (their newer planting scheme has similar ponds and open spaces to here, which are an important consideration in an overall woodland context). Other European countries are ahead of us in recognising 'wood pasture' history with maybe the exception of the New Forest and some historic parklands. Closer to home, it's been a great year overlapping with some neighbours and locals - I hope I come across as passionate rather than condescending, but I can be a bit of a doom-monger of what can go wrong (I've spent 30 years overlapping mainly with woodland and conservation projects with groups of various levels of activity and extent and there are always things to learn and things to share), or what multitudes of paperwork / directives / guidelines (changing over time) have to be considered regarding appropriate management, long term practical and academic consensus from studies etc. - but that at least puts a hand-brake on potentially rushing into things. The next couple of years pose some economic and political challenges. 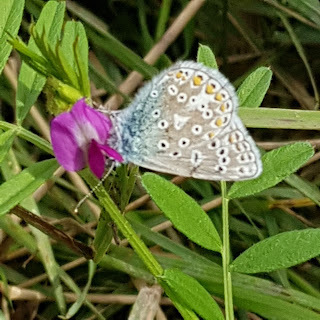 At the moment the structured and integrated landscape and habitats guidance I work to goes back to the EU Habitats Directive and how that is interpreted and enshrined under present English and Welsh legislation. (Welsh devolved powers add a further tangent, particularly as objectives and resources begin to diverge). That now is up in the air and various external pressures and potential changes pose a threat to landscape scale projects generally with respect to the direction things might go. I don't claim any subsidies (from a personal and moral perspective, the woodland has to at least break even from timber produce and be sensitively 'productive' with a wildlife balance). At some point in 2018, I hope to host an open weekend at the woods. An informal couple of days outlining the site objectives for trees and wildlife, together with relaxed wildlife observations etc. I need to ensure site access is safe beyond just the footpath through the site and more easily accessable. 2017 has seen a sudden upsurge in random visitors wandering 'off-track' and actually being quite challenging if challenged. Various reasons are behind reminding folk the site is privately owned and operated. Firstly personal safety, as it is an actively managed woodland worksite. 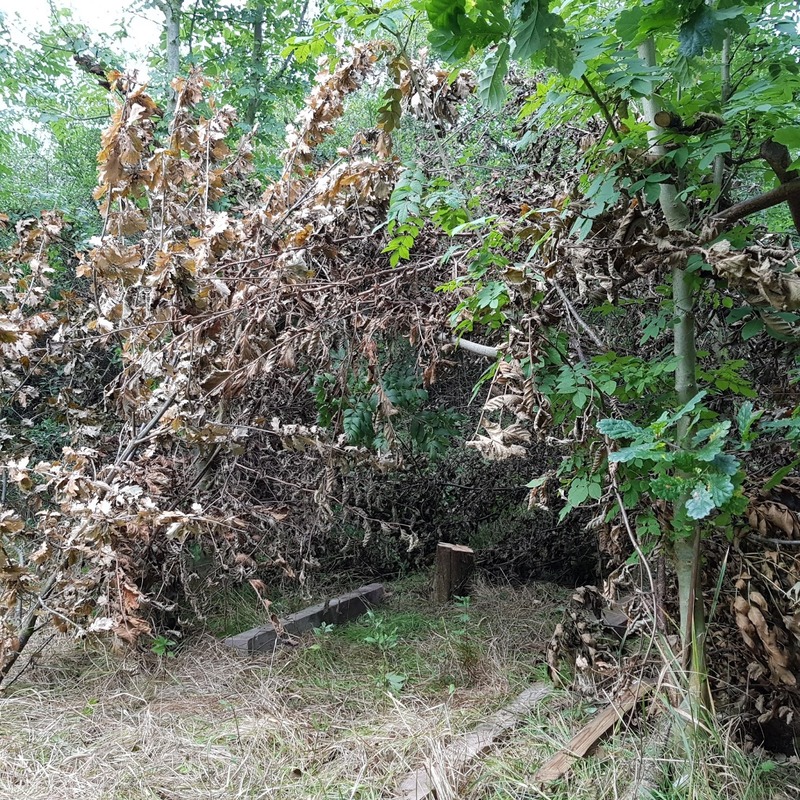 Next, biosecurity is a big issue with respect to native woodlands - sadly ash die-back is confirmed on site, this could affect 25% of the trees regarding viability / longevity. 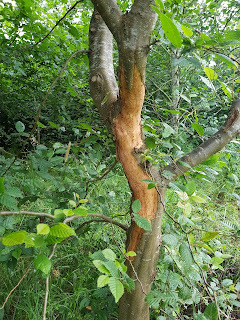 Although mainly an air-borne problem, people and dogs randomly walking through off track, risk spreading this tree disease - particularly to non-infected offsite locations elsewhere too. One problem has been random walkers with dogs off-lead (Some driving some distance to the locality and parking across the access gates, with no interest or concern for site operations or wildlife). Two years ago there was seasonal grazing livestock on-site and grazing for grassland species management will shortly resume. People suggesting "Oh, they are O.K." 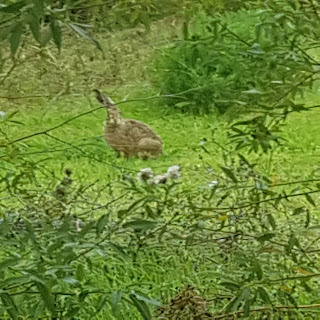 with respect to dogs off-lead is not acceptable and is frankly irresponsible with respect to wildlife and ground nesting birds on site. I really want to move the woodland site forward in a positive and informed way. I hate prohibitive signs, but the irresponsible (and sometimes illegal) actions of a small minority have pushed a trial of a few reasonable reminders at entry points. People are welcome to visit at reasonable times, but by prior agreement and contact. (Location, safety and response details available). 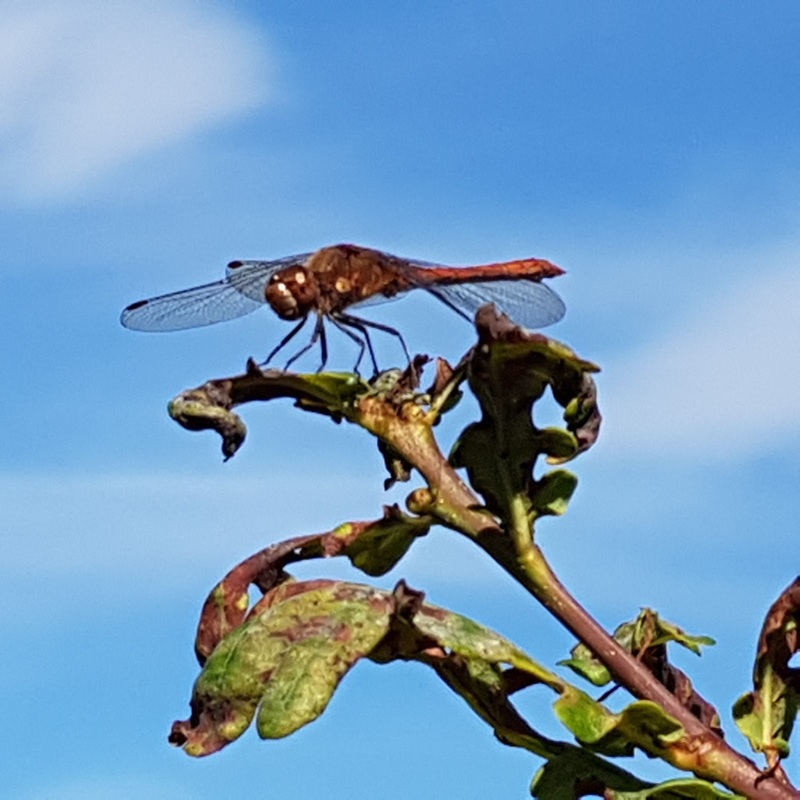 I'm really keen to share low impact sustainable woodland practice and associated crafts, as well as learn and share from experienced practitioners and the educational value from wildlife and ecological observations. 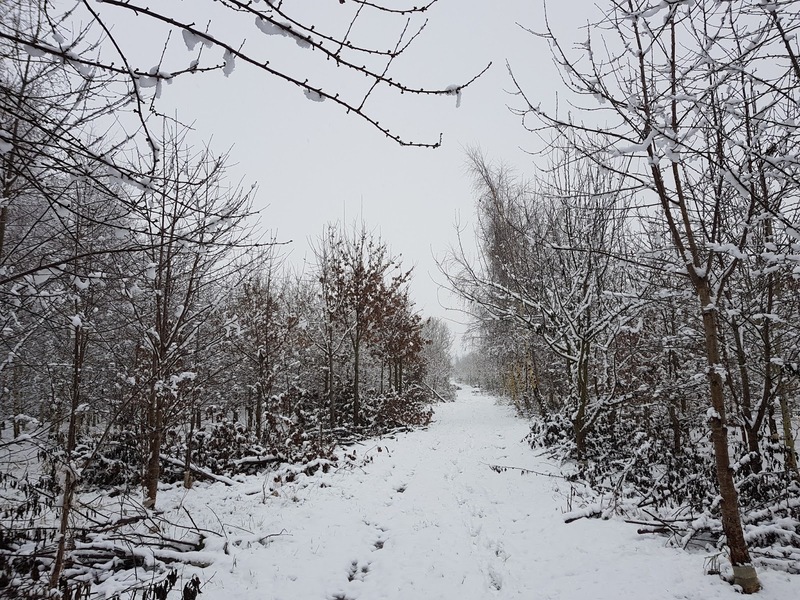 This is two-way and ranges from folk wandering through a woodland for relaxation and contemplation, across the board to high level habitat surveys and species enhancement. 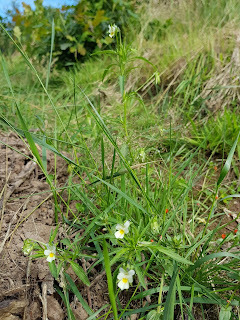 Next major scope of work (once winter dries out and warms to spring), is further local / native wildflower enhancements along the footpath (soil disturbance has released a reasonable amount of dormant seed that has germinated from when the woods were open grassland). Together with a more structured management of mowing the grassed areas as proper hay meadow (with increasing species richness). Although not obvious, the overall woodland plot has three different owners, each within their respective boundaries with no overlap of involvement, other than neighbourly good-will and general habitat / tree and wildlife considerations for the landscape mosaic as a whole. For myself, the access gateway is shared halfway for the plot behind and together with the neighbour we work towards access safety and a gradual move towards a safe roadside sight-line, balanced against reinstatement / replanting of hedge and verge wildflowers etc. For whatever reason, random additional non-owner vehicles in the gateway have disrupted what little stone bed was of use, so a new limestone base has gone in. Over the last year quite a bit of liaison work has gone on with academics and woodland experienced folk with respect to the overall habitat and appropriate forward management. 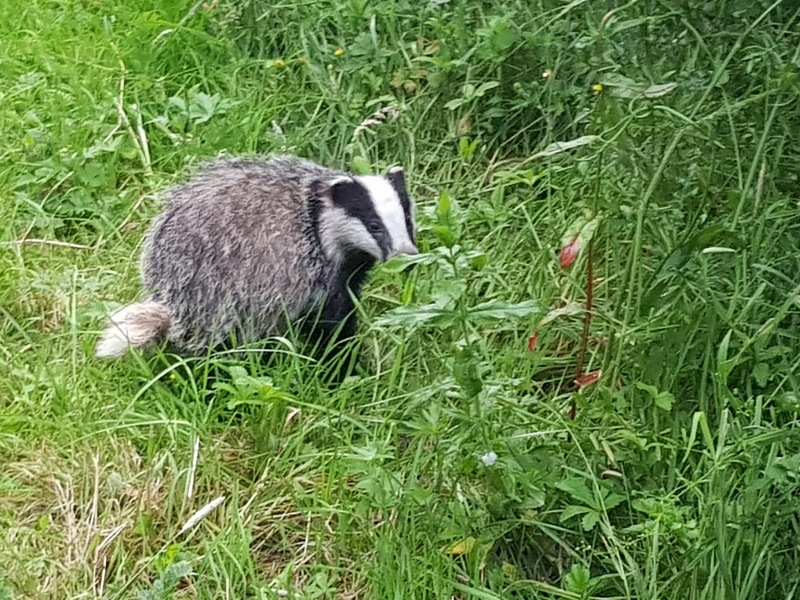 I've spent nearly 30 years in various ways and with various groups, folks and activities regarding woodland management, particularly balancing sensitive sustainable production with wildlife habitats and conservation (I spend a lot of time visiting other sites). 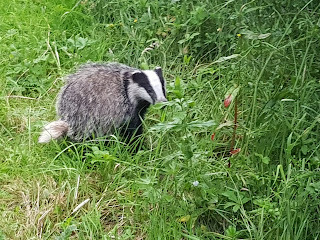 The woodland has had a few invited visitors this year, particularly ecologists, conservationists and wildlife observers. This is to establish what species (plants, mammals, reptiles, birds, insects) are on site, so that appropriate tree and grass land management goes in the most beneficial direction. Part of the work below is to make things safer for visitors, particularly for those travelling and not familiar with the locality. Risk assessments and site briefing, groundwork and crushed limestone delivery out the way, time to get the base rolled down and finished. 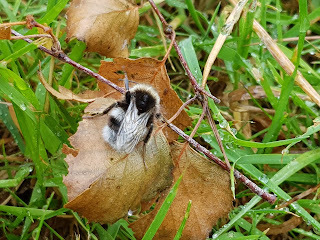 A busy few months both at home and at the woods, which left an unintentional gap on monthly woodland blog updates. 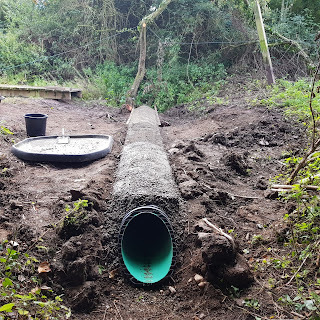 A couple of away-days too, particularly facilitated by Smallwoods at Ironbridge / Coalbrookdale, as well as attending a couple of country shows that have a reasonable environmental aspect and a return visit to the Bulworthy Project woodland in Devon. Back in the woods, a bit of species and wildlife spotting and some preparations prior to the reintroduction of seasonal grazing in a couple of areas. Some steady work on the Public Footpath that passes from Worthenbury to Threapwood through the woods - after some positive dialogue with the Council Rights of Way Officer, who was looking at issues elsewhere in the village. A narrow wooden bridge over the central ditch was getting a bit dilapidated and slippery in the winter months. 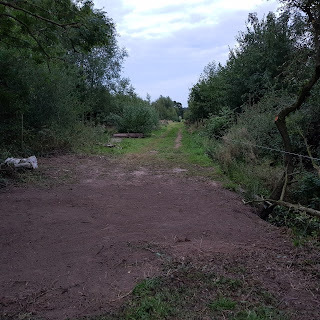 Longer term plans are to mow the path at a wider width between the trees, together with coppiced / shrub layer sides for greater light and shade variation and ultimately a wider range of species biodiversity. 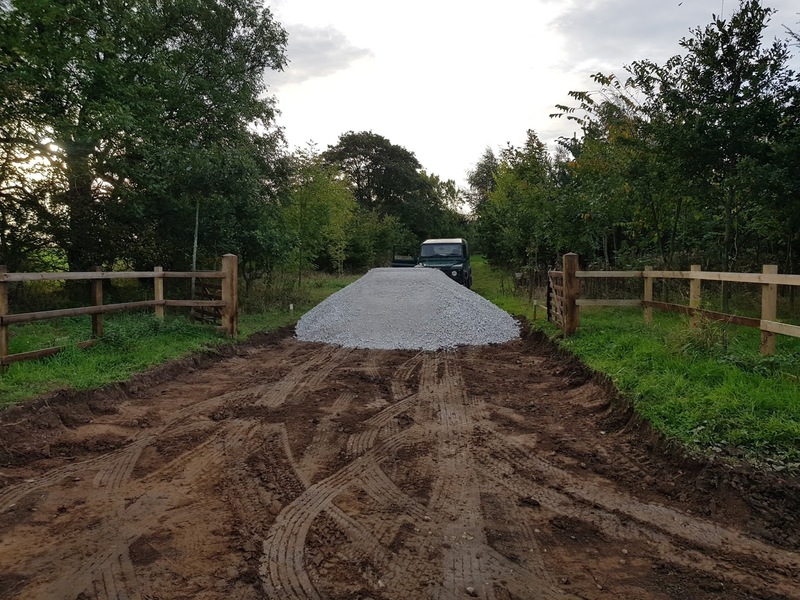 To make access safer and to be able to pass through with the mower more easily, a culvert for the ditch has been put in place of the narrow wooden bridge. 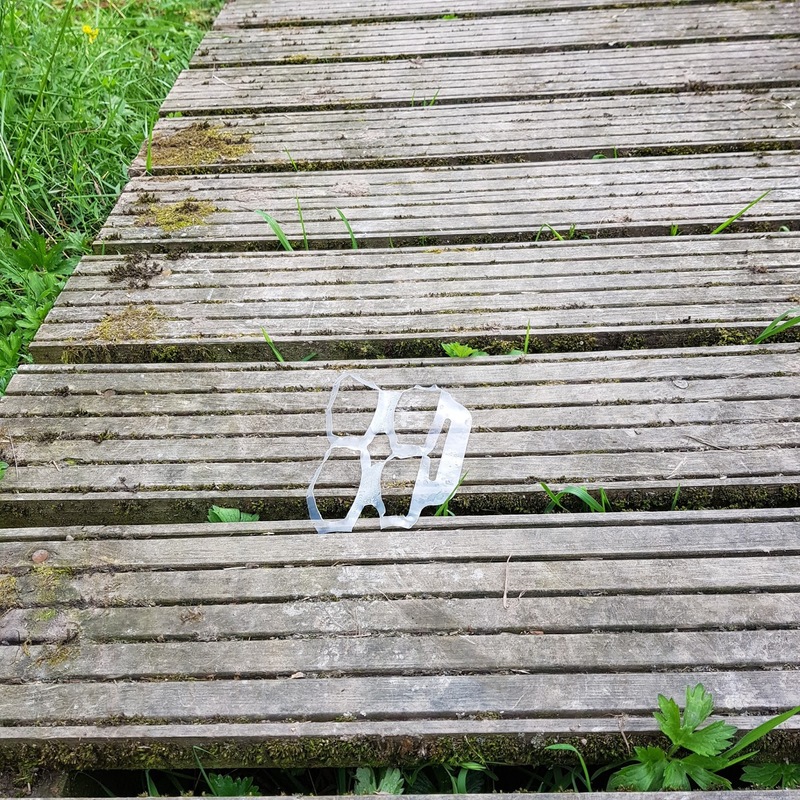 The plastic packaging strip in the photo below, is about the most damaging litter for wildlife that can be left lying around. Too easy for small mammals and birds to get trapped, but not easy to get out of. A couple of folk have been wandering off the path too. The woodland is private land with no concessionary access (unless by prior arrangement). 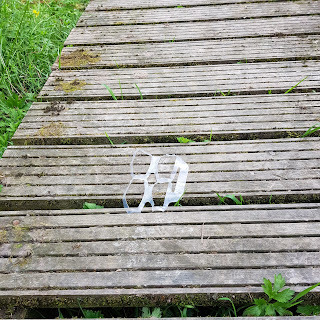 A couple of times dog walkers have been asked to put their dogs on a lead whilst away from the path. I won't accept "Oh, they are alright." They aren't! They should be under close control along the path and preferably on a lead when seasonal grazing livestock are on site. 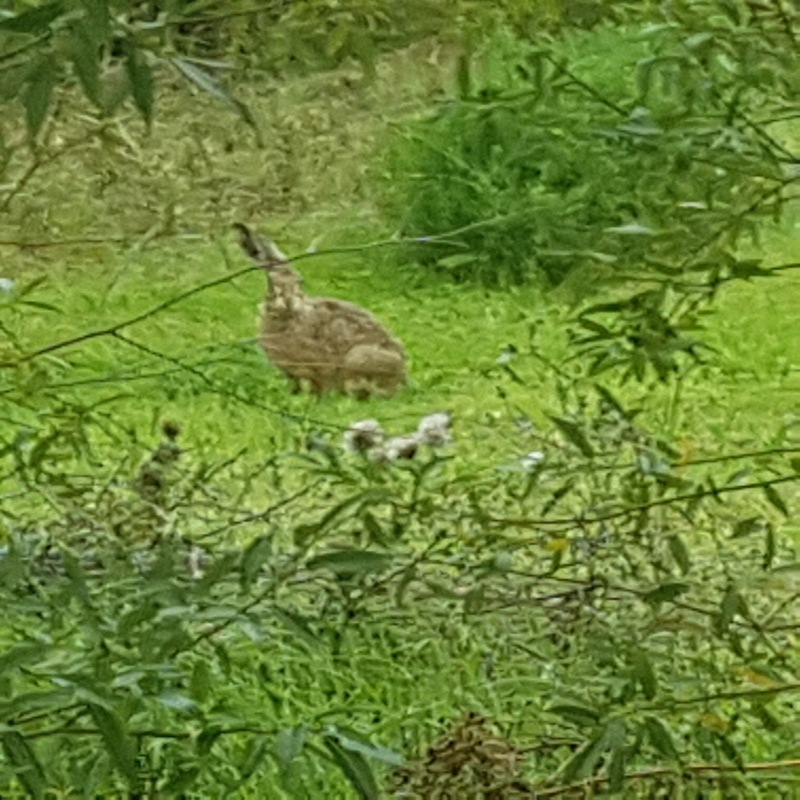 Importantly, there are a colony of hares in the woodland and it is mainly for this reason people are respectfully requested to keep to the Public Footpath and their dogs under control. 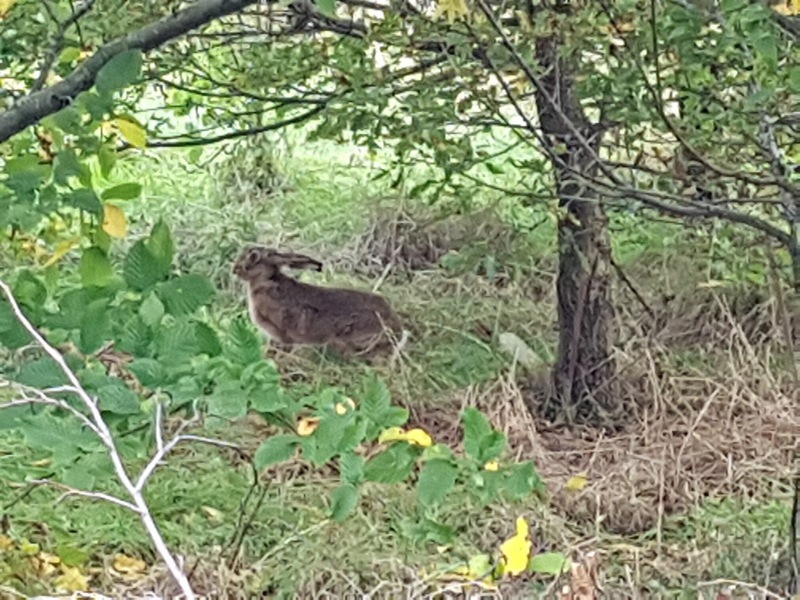 One of the hares on the woodland margins. With the risk of coming across all "Get orff my laaand..." Someone has been practicing bushcraft skills in the woods. 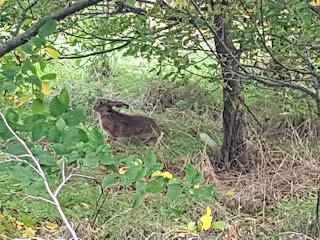 Great that youngsters are out and about in the natural environment, but some discussion beforehand would have been appropriate before building a den. 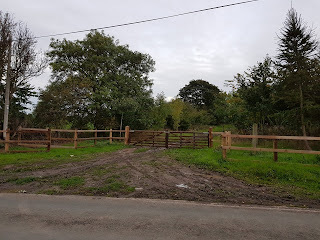 A little annoying that some fencing materials had been used from in the middle of a job, but also it has been put up right in the middle of an Ash Die back disease area. 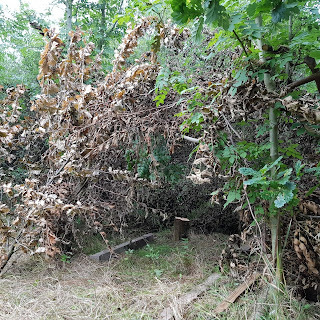 Although this tree disease is mainly spread by spores airborne, trampling through the fallen leaves increases the risk of spread - particularly to other woodlands via footwear. People should ask before wandering in and doing stuff like this. 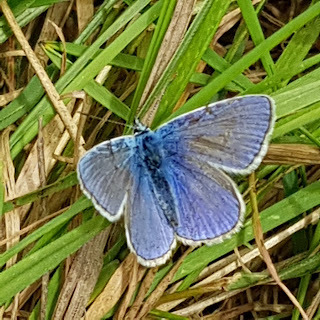 Quite a few Common Blue butterflies around earlier in August. A proportion of the woods is managed as traditional grassland / meadow for biodiversity (11 years ago it was open fields before the trees were planted). Mowing for hay is helping re-establish grassland plant diversity. 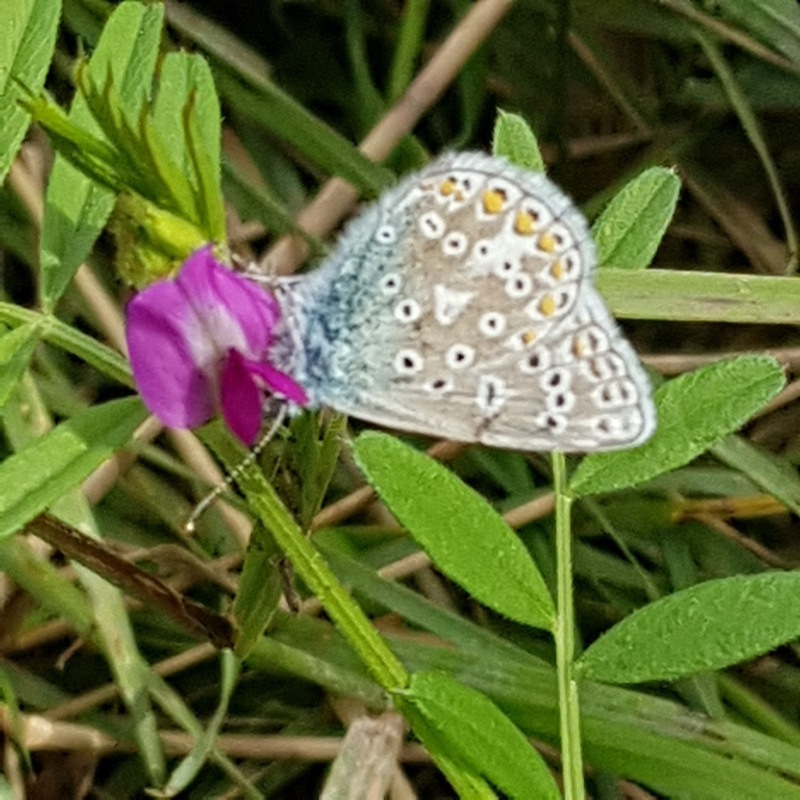 Noticeable are knapweed, birdsfoot trefoil, cuckoo flower, vetch and cowslips. Thanks to the neighbour for doing the mowing and putting the traditional baler to work as part of productive management of the grass / meadow areas. 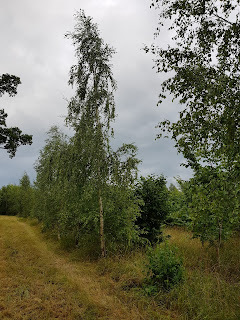 Birch coppice from the woodland edges is regenerating after its first cut (approx every fifth tree on a yearly basis. Some of the willows have been pollarded at head height and the first large coppice area has regenerated nicely with multiple stems between 1 to 2 metres in the first season. 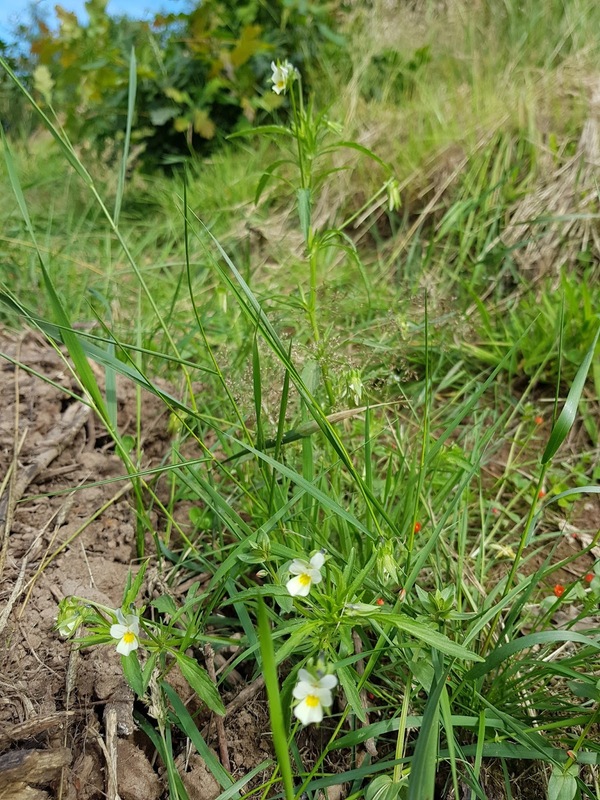 Some ground work along the footpath has disturbed some dormant seeds with field pansy Viola arvensis appearing. The extra light from selective tree thinning along the footpath is part of a longer term programme to plant more appropriate local / native wild flowers. 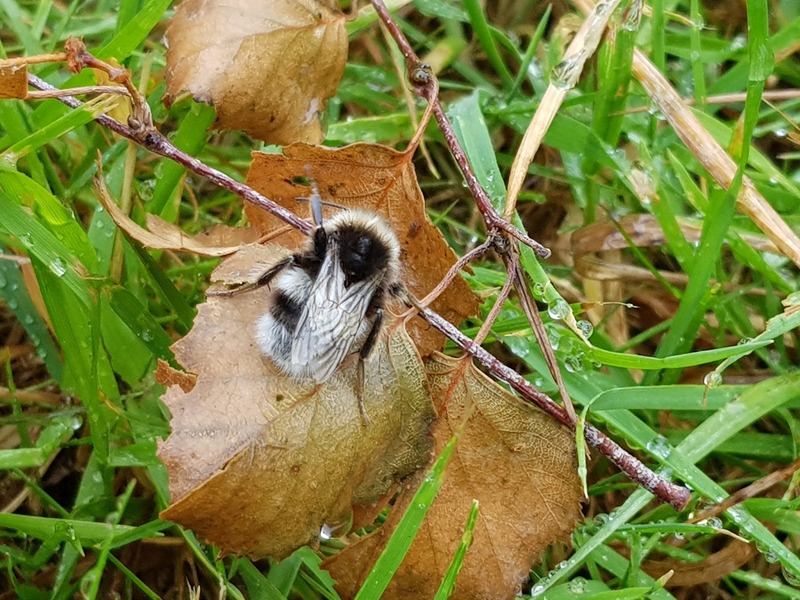 One curiosity is this bumble bee - I'm told it is a white tail bee, but these usually have a yellow middle stripe. 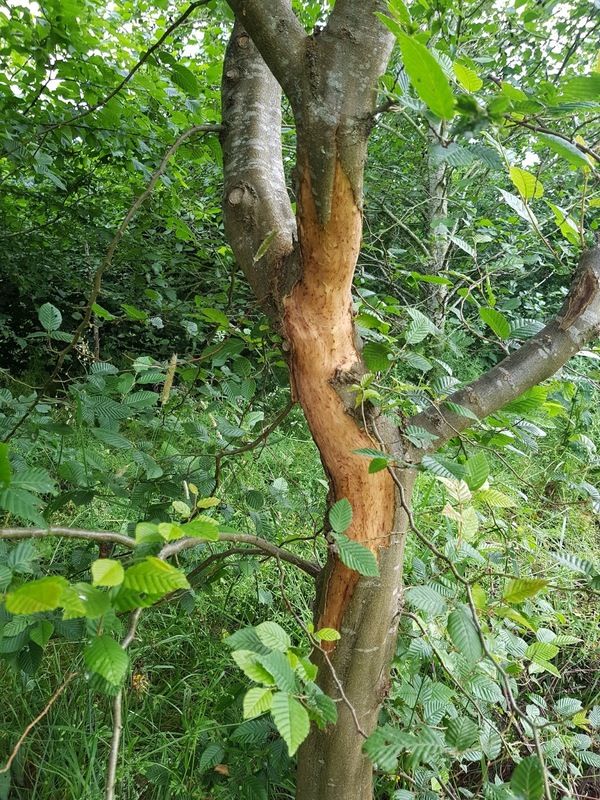 Grey squirrel damage is still a problem, particularly with the willows at height - although the photo is one of the Hornbeam treas from ground level (since coppiced). Badgers have left a few tracks, but no obvious signs of a sett (guessing the ground conditions are too wet). 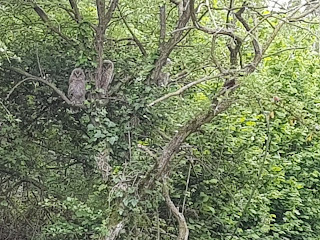 Owls (Tawny and Barn) frequent the woodland and the long stretch of footpath with grassy edges give a good foraging ground. The area is also good for bats to swoop through. 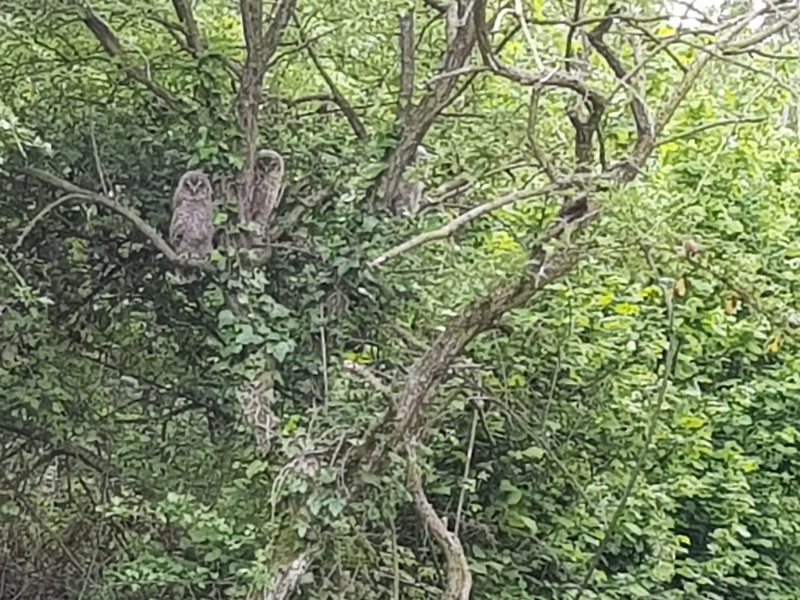 The photo is of three owlets along the footpath earlier in the year.